S.A. Larsen, Award-winning author of middle grade & young adult fiction: GRAFFITI WALL: Kelly Hashway, Picture Book Author of MAY THE BEST DOG WIN! GRAFFITI WALL: Kelly Hashway, Picture Book Author of MAY THE BEST DOG WIN! The GRAFFITI WALL is excited to have our very first Picture Book Author share her writing splats with us!! Plus, she's offering up SWAG & a PB Critique!! Mother, wife, and writer of all that encompasses children's literature--YA, MG, & Picture Books--she's also a supportive critique partner and active member of YAlitchat, offering her suggestions and guidance to other writers. You're a children's author, in all three realms: young adult, middle grade, and picture books. What made you turn to writing picture books? I have a four-year-old daughter who has always loved books. So for the past four years, I've spend a good portion of my day reading picture books. I couldn't help but fall in love with them. The first time I even thought about writing for this age group was when my daughter asked me to read her a story about Santa and the Easter Bunny. I didn't know of any, so I wrote one. It was actually a short story and I had it published. But I loved writing for the age group so much that I decided to try picture books next. Once you wrote your picture book, May The Best Dog Win, what was your next step? Revise, revise, and revise some more! I gave the story to some trusted individuals to pick apart and the manuscript was much better for it. Then I started submitting to publishers and worked my way through the slush. What is the process of publication for a picture book once a publisher makes you an offer? You wouldn't believe how much editing goes into a picture book. Every word counts and every scene needs to be able to work with the illustrations. I went through rounds of edits and then more after the illustrator drafted the drawings. And then a few more after that. It was crazy, but in a good way. I'm very happy with the end result. Did you work personally with the illustrator? Not really. She and I have talked via email, but she took my writing and brought it to life pretty much on her own. And I couldn't be happier with the way she did it. I can't agree more. The book is so colorful and energetic. Do you have a method for mapping out a picture book? I try to picture the book's layout in my mind. I make sure I have enough scenes and that I don't rely completely on the text. It's really a fifty-fifty between the author and illustrator so you have to give up some control, which isn't always easy to do. What was your inspiration for writing May the Best Dog Win? Did you brainstorm? One of my many many quirks is that I vacuum everyday. My huge German shepherd is afraid of the vacuum. She sniffs it, gets in its way, and then dashes out of the room. Two seconds later she's back doing it all over again. It made me wonder if she thought the vacuum was a strange looking dog. May the Best Dog Win evolved from there as I brainstormed how a vacuum could be viewed as a dog. Signature Alleyway question: you're going into space with only food, your cat Gomer, and a character from a book. Which character would you bring with you? Kate Weatherall from The Mysterious Benedict Society. She always carries around that bucket with helpful things in it. She is allowed to have the bucket in space, right? You're agent is the fabulous Lauren Hammond (ADA Management). How's it working with an agent? Lauren's amazing! I'm so lucky to have her on my side. Working with an agent is great because you have someone championing your book. I know Lauren believes in me and my book, and that's such a great feeling. She calms me down when I'm stressing, and she keeps me up-to-date on everything that's going on with my work. Best advice ever given you that you'd like to pass on. I was recently at my regional SCBWI conference and Donna Gephart talked about never giving up because you never know when you're on the one-yard line. You may be closer than you think to achieving your goals. Imagine where we'd be today if great writers quit on that one-yard line. Could we have anymore supportive of an author friend in Kelly?? Awesome. 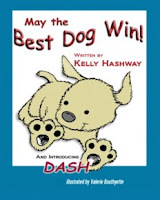 For more Kelly and Dash, visit Kelly on her WEBSITE, Facebook, Twitter, & Dash's Facebook Page. And even better, support them both on Freado. ~ a SWAG packet: May the Best Dog Win t-shirt, a doggie bag including a pencil, bookmark, bracelet, magnet, sticker, and candy. Congratulations on the book -- it looks adorable! And what a great premise! I, too, have a big German Shepherd who was terrified of the vacuum cleaner for the first 6 months we had her! Congratulations Kelly! My dog is terrified of the vacuum too- I love the image! Congrats Kelly. I loved the vacuum story. I always admire picture book writers for coming up with so many new ideas and like Kelly said, each word counts so much. That's adorable! I had a huge dog whose chief nemesis was the vacuum as well. And--that advice about not knowing when you're on the one-yard line? Gold. Thanks! @Sarah, is the one-yard line advice great? Donna was an amazing speaker. @Natalie, because every word counts so much in picture books, I've learned to be very careful with word choice in everything I write, no matter the level. Yay Kelly! Can't wait to get my hands on a copy of your new book. Congratulations! Grrr @ Blogger for eating my comment! What I said before was ... I LOVE the one-yard line analogy. It especially holds true for us sporty gals. Great way to think of it to get the motivation up to keep pushing even when you may not be feeling it. What a cute looking book and premise! My older dog used to be afraid of the vacuum, but now he just gives me a look like, "Whatever, Mom!" The puppy we have doesn't seem to care either way. Best of luck with the new PB! It looks like such a great book! And thanks to Kelly for sharing her story! The book looks soooo fun! Thanks for sharing. That's so awesome!! It looks adorable, and I have to say I really admire PB authors. To me that's the hardest to write. It's fascinating learning about the process of picture books - I'm clueless! Congrats, Kelly. Looks adorable, Kelly. Congrats and best of luck. @LM Preston, I hope you like it! @Tracy, I love passing on this analogy because it is very true. I was most stressed out in my agent search the week before I got "The Call". Sometimes we do get overwhelmed when we are on that one-yard line. That why we can't ever give up. You just never know. @Kris Yankee Thanks! I wish my dog would've gotten used to the vacuum. Of course if she had, I may not have written this book. So I guess it all worked out for the best. @Lydia, thanks! I'm glad you enjoyed it. @Shannon, I'm glad you like the idea. It was so much fun imagining all the ways a dog could think a vacuum was another strange breed of dog. @Lisa Gail Green, believe it or not, I used to feel the same way about writing PBs. Writing short stories helped me learn the importance of making my words count and studying great PB writers taught me the rest. I love learning from other writers. It really is the best--and most fun--research for the craft. @Talli, @Kai, @Tracey, thank you all! GREAT interview! Congrats on all your success! I love the one yard line reference! This is such an adorable book. Great to see the interview here, you two. This is so great! Congrats, Kelly! Best wishes to your success! @cleemckenzie, glad you liked it. A very nice interview. I enjoyed learning more about you, Kelly. Congratulations on your book. @Elizabeth, yes they are. I can't tell you how much my daughter inspires me everyday. Congrats Kelly! I have a dog and I can well imagine her barking her head off at a dog-like vaccuum cleaner. Looks great! 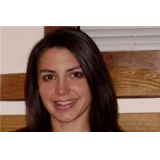 @catherinemjohnson, thank you! It's nice to know my dog isn't the only one who has this problem.